If you want to know how to promote your product through Twitter, you can probably learn something from Di Castle of Swanage. In 18 months, she’s sold hundreds of copies of her ‘Grandma’s Poetry Book’. That’s some achievement, particularly for a volume of poetry, and she’s confident there’s potential to sell a lot more. 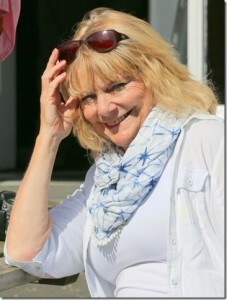 Di kindly agreed to share with you the story of how Twitter helped her find and then grow her market. Whatever you sell, or promote, through social media, there’s something to learn from her experience. Of course, not all of Di’s sales come as a result of using Twitter and other social media channels. She sells at fetes and fairs, and even sold from a Swanage beach hut in the run up to Christmas. But Twitter has helped her sell further afield and, perhaps more significantly, build a network of valuable contacts. Having written for years, when Di became a grandmother she pulled her poems into a collection and began looking for a publisher. People were genuinely complimentary about her work, but poetry books don’t get a lot of space on retailers’ shelves. She found an illustrator, Denise Horn, also from Swanage, and at the Winchester Writers’ Festival she connected with self-publishing specialists Matador. When she signed up, Di agreed to pay Matador to promote her book on social media. But the publisher then spotted she already had a presence on Twitter and suggested that rather than pay them, she could take on the book’s promotion on social media. Di then took the sensible step of getting some training. She attended some courses, including a workshop I ran with my wife, Rachel, at Purbeck Literary Festival in 2015. Like so many people, Di didn’t really understand how a hashtag worked. When it was explained, and she was encouraged to engage with hashtags popular with authors, such as #amwriting and #amreading, she found her tweets began to get attention. Di started becoming strategic about who she followed on Twitter. Previously it had been a very mixed bag, so she unfollowed many of them and became more focused on following bloggers, particularly parent bloggers. She discovered them through the #mblogger and #pblogger hashtags (that’s mum bloggers and parent bloggers). Di engaged with the bloggers, retweeting them and starting to build relationships. Then she asked if they’d like to review her book, which several did. The bloggers then shared links to the reviews with their audience. By now, Di knew that the people most likely to appreciate her book were grandparents. They’d either buy it for themselves or people would buy it for them as a gift. Through Twitter she discovered Gransnet, an online community of grandparents, who reviewed her book. Then she tweeted to Saga, who agreed to run a competition for a signed copy of her book. The exposure she received brought in hundreds of new followers. All the time, more and more people were getting to hear about ‘Grandma’s Poetry Book’ and many were buying. Perhaps more satisfying, for a writer, was the positive feedback about the book. Social media makes it really easy for authors, and anyone else with a ‘product’, to hear what people think of it. One important lesson for Di has been that someone she’s sold to once often becomes a repeat customer. Because the book makes an ideal gift for a new grandparent, people come back for more copies for friends and family. This gives her confidence that the book will keep selling. She is continuing for look for outlets frequented by her target readership. She’s approached the National Trust and the book should soon be appearing on the shelves of their gift shops. Through Twitter, Di has developed a strong network of contacts. Some of them have asked her to write for them, giving further opportunities to grow her profile in the online communities of which she’s become a part. She’s even written about her experience of getting to grips with Twitter on the popular women’s website, Henpicked. Today Di spends about half an hour a day on social media, covering both Twitter and Facebook. She’s now much more confident about using social networking to promote what she doea, although she admits that, like the rest of us, there’s still plenty to learn. 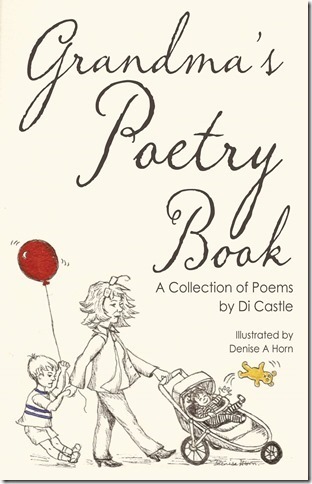 Click here to learn more about Di Castle and her 'Grandma's Poetry Book'. First impressions count for a lot. However much we might say that we want to judge by merit, not appearance, our initial opinion is heavily influenced by how someone or something looks.Whether we’re researching a restaurant or shop, a new business contact or potential employee, a website or social media profile, our reaction will be affected by those first impressions. This is why the quality and presentation of the headshot photos you use on social media are so important. I recently picked up some useful tips from photographer David Morphew which I’m sharing here. We humans are a social lot and we’re naturally drawn towards pictures of people. Hence the recommendation to use a headshot or portrait photo on your social media profile. We find it easier to connect with people than with a logo or some other, more impersonal image. 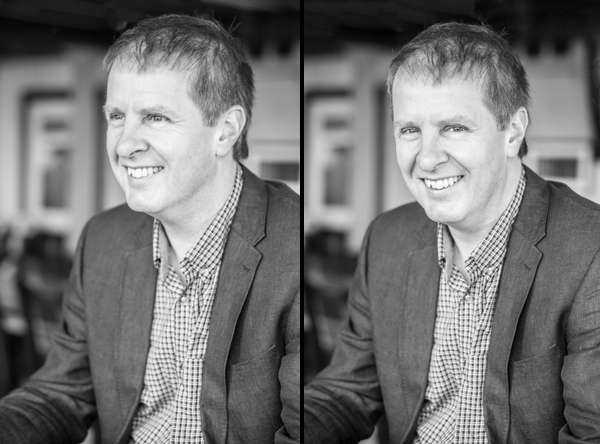 A headshot photo brings the added benefit that people recognise you when you meet in person. As portrait photographer David Morphew was updating the images I’ll be using on my social media accounts, we chatted through the elements that make up a great headshot. This is my tip, not David’s. A good quality portrait says a lot about your attention to detail and the best way to get one is by using a professional. Or at least a good amateur. 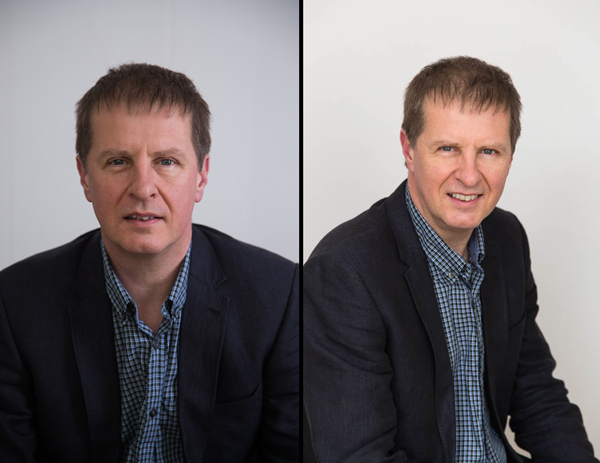 During my training courses, when I talk about using portrait or headshot photos, quite a few people tell me they don’t like photos of themselves. In most cases, I suspect that’s because they’ve not been photographed professionally. And even if you really don’t like to see a picture of yourself, you’re not putting an image on your social media profile for your pleasure. You’re doing it as part of your online marketing. People do business with people, not logos, so I recommend you start that person-to-person relationship as early as possible. Photos of yourself that you’re not embarrassed to use are a great asset. I find it hard to smile for the camera. That’s because I don’t usually pay much attention to how I smile - it just happens. When David asked me to smile, I became aware of all those facial muscles that normally work unconsciously. Part of the photographer’s skill is to get the subject to relax and to forget those facial muscles. David’s jokey, slightly irreverent style made that easy. He coaxed me into a variety of facial expressions without me needing to try too hard. I have a newfound respect for professional models who know how to manipulate their look! Changing the the environment can help you relax. 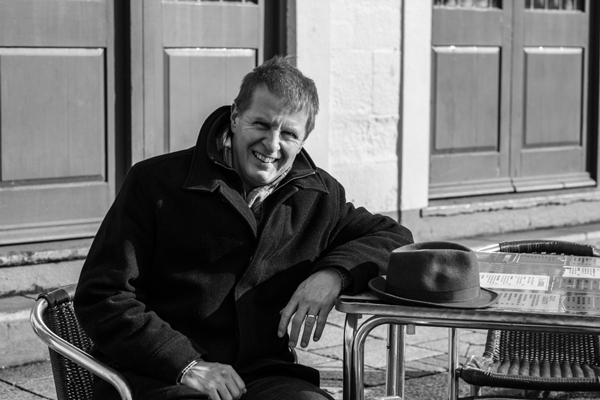 Below are two photos that I like - one is posed and the other David snapped when we went for coffee after the shoot. I thought we were done when we got to the cafe, but clearly not. David recommends that you wear your normal business attire for a photoshoot, and ideally have some variations on it. You’ll look most comfortable when you’re wearing clothes that you’re used to. It also helps people connect with you more easily, both through a photo and if you meet in person. Variations in appearance can help you transition between the serious professional look and the more relaxed, approachable style. Both may deserve a place in your portfolio, depending on the context in which the photos are to be used. You may want to use a more relaxed, smiling image on Twitter, but adopt a more formal look for LinkedIn. If you’re using the photos to go out with press releases, you want an image that matches the tone of the story. David talked about sculpting with light. From the way he speaks, you know that he’s continually thinking about how to use lighting, both natural and artificial, to get a better result. The easiest way to discover what approach to lighting works best is to try several alternatives. David shot me in his studio using natural light, then with a seriously large but not overwhelmingly bright flash. After that, we went outdoors into a chilly, bright February morning. While we liked the idea of the outdoors photos, they didn’t make it to the final portfolio. Why do passport photos look so grim? Because you’re staring directly into the camera lens, with no smile, and the lighting is purely functional. David’s advice for getting a decent headshot is to position your shoulders at an angle to the camera. Take a look at the photos below - one is square on, the other at an angle. The camera itself doesn’t need to be at the same height as your face. It could be looking down on you, or looking up. Looking down is popular because when you look up to the camera, the skin beneath your chin is stretched, helping to mask sags and bags. It’s not obvious from these photos, but when David took them, I was sitting down and he was standing up. Many of my photos looked great straight out of the camera. David’s skill with lighting, angles and depth of field was evident. But there was still room for improvement using Photoshop. David hasn’t performed virtual plastic surgery on me, trimming off pounds or reshaping my nose and chin. All that was possible, I’m sure, but it wasn’t what I wanted. Now it’s time to play ‘spot the difference’. Before reading on, take a look at the two photos below to see what’s changed. How many differences did you count? I’ve not asked David what he altered, but there are at least three changes. First, it’s brighter, bringing out more of the colour in my face and clothes, and brightening the background. Secondly, I’ve been flattered by having the lines around my eyes softened. They’re not hidden - just not quite so obvious. Thirdly, my hair is a little more under control. I confess this is a change I made having received the photos. My hair does have a tendency to stick out at odd angles, despite my best efforts to take control of it. In this case, that control came through Photoshop. When I put the two images side by side on my computer screen, I also thought that David had airbrushed out a mark on my face, but then I realised it was a mark on my screen! How often should you update your headshot photos? The photos I’ve been using until recently were taken in 2008. That’s eight years ago. I leave it for you to judge whether I needed to update them. I recommend that you consider updating your headshots every two to three years. Your appearance may not have changed much, but perhaps the image you want to portray has. Putting fresh photos of yourself on your website and social profiles gives them something of a refresh. Don’t be shy when it comes to using headshots as part of your marketing. Be confident that your face is an asset. Using good quality headshots means you’re taking control of how your face appears, in order to help make that all-important positive first impression. Click here to learn more about photographer David Morphew, who's now based in Dorset. Business networking can be scary. I remember the nerves the first time I walked into a room full of strangers at a networking event. For some, online networking provides a more comfortable place to mingle and chat with other firms. But some still struggle to unlock any value from networking, online or in person. The strategies for getting results from networking are very similar, whether it’s on Twitter or at your local Chamber of Commerce. I spoke to professional networker Lorna Trent to get her tips on how to not just become successful at networking, but also how to make it a pleasure! Lorna Trent gets paid to network on behalf of other firms. She has nearly 20 years of networking experience, 10 of those gained at Dorset Chamber of Commerce and Industry (DCCI). At DCCI she helped reinvigorate a networking programme, which grew from 10 events to over one hundred per year. As a result of the networking opportunities they created, DCCI came second in a national competition for Excellence in Networking. Arranging events aimed at different types of business networkers was central to DCCI’s strategy, said Lorna. They varied the size, theme and venue of their many meetings. Business networking tip #1: Find a networking group or format that you’re comfortable with. Some groups are very unstructured, while others are quite the opposite. Visit different types of meeting to get a feel for which format would suit you. A common complaint from non-networkers is that they tried it but it didn’t bring in any business. After her time at DCCI, Lorna went to the non-profit housing organisation BCHA, as fundraising manager. Lorna spent much of her time networking and identified that around 60% of donations came through networking contacts. Business networking tip #2: Give networking time to get results. Whether you’re tweeting as part of #dorsethour or going to your local Chamber business breakfast, don’t expect to come away from your first or even second meeting with some hot business leads. Be patient and they will come. After leaving BCHA, Lorna spent time working out what she wanted to do next. Whilst analysing what she was good at and really enjoyed doing, she identified her strength in business networking. Could this strength be converted into a business? What Lorna really enjoys about business networking is connecting people. She listens to people talking about their situation, their needs and aspirations, and she spots opportunities to connect them with someone who could be able to help. As a result of helping others, Lorna also helps the organisations she represents. People like and trust her - key ingredients to securing business, donations or support. Business networking tip #3: A great way to start networking is to ask people about themselves and to listen with genuine interest. The best networkers listen more than they talk. Today, Lorna goes to several networking events each month on behalf of her clients. She was initially surprised that most of her clients were already busy networkers themselves. She had expected to be working for people who didn’t want to network. Because her clients are successful networkers, they know the power of business networking. They hire Lorna because they can’t get to as many networking meetings as they’d like. Lorna makes it clear that she’s not a sales rep for her clients. 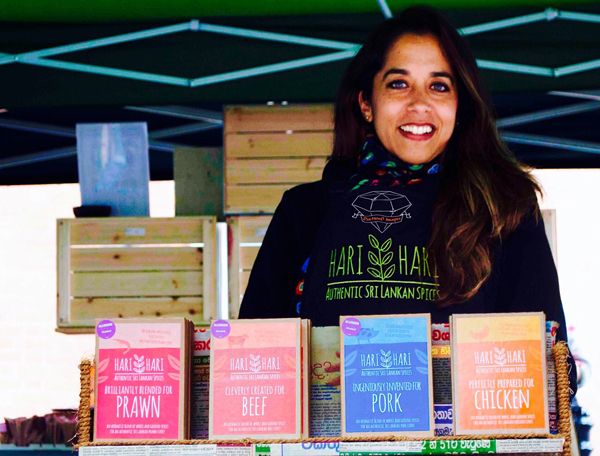 Her role starts and ends with business networking, where she connects people who have needs with those who could help supply what’s required. Business networking tip #4: Accept that most people you meet at a networking event are there to sell. Listen to what they have to offer, because it could help you or someone you know, and by helping someone they then become keen to help you. Lorna does not use social media. She set up a Twitter account three years ago and has tweeted once. For her, networking is about meeting people face to face. However, the networking principles she describes - listening to people, connecting people, and building trust - apply whether you’re networking through tweets or at a breakfast meeting. However, there was one tip I wanted from Lorna that particularly applies to an offline or real-world networking event: how do you find someone to talk to at a networking meeting when everyone else seems to be chatting away? I recommend that you turn up early to networking events, because that way it’s easier to engage in conversations as people arrive. But what happens if you turn up later and the room is packed with small groups chatting away over coffee? How do you avoid wasting your time by being a wallflower? Business networking tip #5: Look at the body language to find a group that’s still in the shallow end of a conversation. They’re exchanging pleasantries but nothing serious. They’ll welcome someone new into the group and some will even be grateful to have another person to talk to. There are networking groups in Dorset to suit all tastes. Some are referral groups that only allow one member per trade or profession and try to keep a score of how much business they’ve generated. Others offer little more than somewhere to chat over coffee and a breakfast. There is no ‘right’ or ‘wrong’ approach to networking. There’s just what works for you and what doesn’t. Here’s a list of business networking groups in Dorset. To find out more about how Lorna Trent and Parrot can help you with business networking, click here. Blogging is a great way to keep adding fresh, highly quality content to your website, something that Google recommends as a way of keeping your visibility high on search engines. Blogging is also a great way to demonstrate credibility to potential customers, because it shows that you know what you're talking about. This post is a list of the Dorset businesses and charities I know of that blog. No doubt there are others and if you know of one, please tell me. - The blog must be written by a business or charity based or headquartered in Dorset. - The latest post must be dated no more than six months earlier than the date when I visit the blog. - There must be at least five posts on the blog, with varying dates. - Ideally the blog posts should be dated, or at least give a clue to their date, to indicate how current they are.